Girl Scouts mark 100th anniversary with Savannah Smiles cookies … New Girl Scout Cookie Savannah Smiles Launched in 2012, which honors the Georgia birthplace of the group’s founder. It’s described as having “just the right number of lemon chips to deliver tiny bursts of happiness. ” This cookie was a close second to being the healthiest choice. Per cookie, it has 2 fewer calories and 0.5 gram less saturated fat, but significantly more sugar. 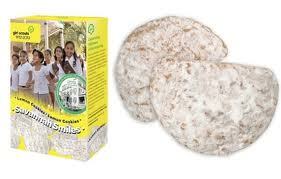 With the Savannah Smiles cookies though, we may not need to be too worried about our waistlines. Ingredients: Enriched flour (wheat flour, niacin, reduced iron, thiamin mononitrate [vitamin B1], riboflavin [vitamin B2], folic acid), sugar, vegetable oil (soybean, palm and palm kernel oil), dextrose, invert sugar, contains two percent or less of cornstarch, whey, corn syrup solids, salt, leavening (baking soda, monocalcium phosphate), natural and artificial flavor, milk, lemon juice solids, nonfat milk, citric acid, lemon oil, soy lecithin, annatto extract. CONTAINS WHEAT, MILK, AND SOY INGREDIENTS. MAY CONTAIN TREE NUTS. The 2014 Girl Scout Cookie Sale Starts January 4, 2014! Copyright © 2019 Buy Girl Scout Cookies.